Mafia's Mobster Gangs have taken control of all the cities around the world over the past decade. This is a turn based strategy game where you battle through the storyline with your team against increasingly harder opponents. You select your deck of characters based on the cards cards that you have unlocked and select which action they will perform every round in order to defeat the opposition. It's a fun concept game, although a little mature for younger audiences. I certainly won't let my pre-teen child get his hands on this one! Here are a few tips and tricks that should help you in the game. Once you have unlocked enough characters you will have some options as to who you want to include in your team. Even though you have three slots available you really should consider having either a tank or supporter, or even both in your team. The other slot of slot(s) being made up of attackers. Each round you only have a specific amount of mana to spend on your attacks, once you are out of mana then the play switches back to your opponent. So in that case choose your attacks well. If you think you can destroy one of your opponents team in that round, then select the correct moves to allow you to do so and work out that you will not run out of mana before he is defeated. It's not just attacks that you have to consider though, you need to think about support abilities such as buffs or health restores. As the battle continues, your rage meter, in the top left of your screen will start to increase. Once it has maxed out, you will be able to use the special rage ability of one of your characters. Choose wisely as it can make the difference between winning and losing a battle. Just like other games of this nature, you'll get a lot more out of it if you are part of a clan. The clan system in Mafioso unlocks once you reach level 3 - Which would probably be in a couple hours of playing. Once you are part of a clan you can play friendly matches with your clanmates, and also borrow you clanmates' heroes, to help you through any tough battles. You do get rewards and special offers every day, so if you are able to check in daily with the game, this will help your progress. You can unlock characters as you open chest rewards in the game. However to unlock most of them you will have to progress through the levels as most characters only become unlocked once you reach a specified level. 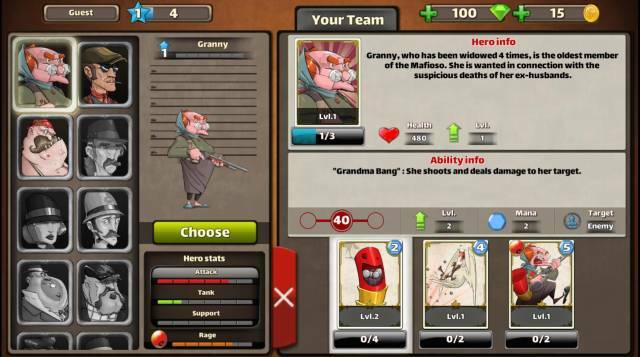 You start with Granny, she is unlocked right away, then during the tutorial you also unlock The Butcher and Bobby Kaboom. If you check their stats you will see what they are good at individually, and also where their strength's and weaknesses are as a team. 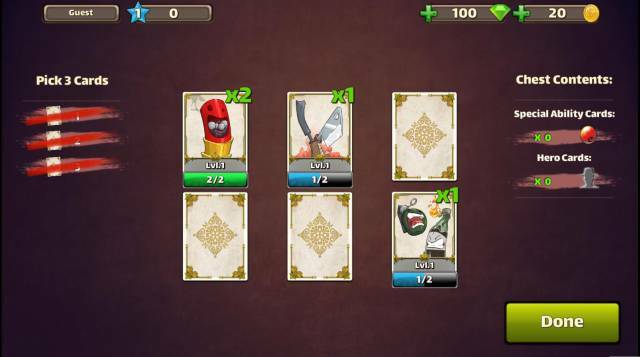 Upgrade your characters if you intend to use them in battle, this will make them stronger so you will win more battles.